I was reading through the 10 Diets You Probably Want to Avoid and beyond the odd ones where a danish author was forced to eat his book and an automobile maker ate weed sandwiches… there were a few that got me thinking. After reading these I thought that it was interesting how far they would go to the extreme or cut back in order to attain the goal that they desired. So many people want a pill or a secret answer to making the debt go away or to become a millionaire, but it takes time, hard word and sacrifices. Some sacrifices that may seem extreme. Take a pause and reconsider just how out-there someone might be when you hear that they re-use the same tea bag all week, water down their bottles of condiments or pick up pennies. It is good to see that some people are seeing that the need to sacrifice or even just cut back is starting to sink in for some outside of the original frugal living community. I do realize that some are doing it out of necessity and the minute things look up they will be back to their usual spendy ways, but I am a hopeful person and I don't think the lessons will be far from their mind. For myself this frugal diet does take on a life of it's own by involuntary means and other times I willingly put myself on a diet to attain a goal. But ultimately, I want that diet to move from a temporary fix to become a way of life that means I am living below my means in a comfortable way. What are your thoughts on a frugal diet? Speaking of food, recently I had a novel idea. Since I am a big fan of yogurt for snacking on as I eat healthier and drop weight, I figured that since milk, butter and cheese can be frozen without any major troubles, I would freeze my yogurt. I had quite a few coupons and a good sale was going on, so I stocked up on 24 containers of yogurt. I had 8 in the fridge and the other 16 in the freezer. Last week I broke out the frozen yogurt and found that, like milk, it needs to be shaken. A lot! Even though the flavor tastes the same, the texture has been changed and it isn't quite what I am used to. And God knows my food has to taste the same! So this weekend I will be figuring out a way to get my yogurt back to the origninal texture so it's more edible to me. I have 12 containers left with a variety of flavors - I'm thinking I'm may to do some re-blending and using new containers. 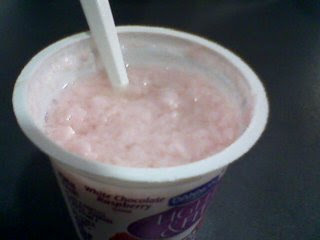 No more frozen, then thawed, yogurt for me. Don't thaw the yogurt --- eat it frozen, like ice cream --- it's great that way! Why not make your own yogurt? It's quite a simple process. I can't even imagine eating store bought anymore. Plus, it's so easy to control what you add it to. One of my favorite Hemingway quotes: "Hunger Makes Good Discipline." I've found the low-carb diets to work for me, though I get very grumpy when deprived of carbs. If you figure out how to make the yogurt normal again, would you share? It'd be really useful for other people, and I'd love to know how it's done. A friend at work just suggested that as well, I will have to give it a try. I am not very handy in the kitchen- my multitasking skills are worse than a 3 year olds. So I usually go for light prep work or eat raw. Hunger is good if I'm in control of when I stop being hungry. I'm eating more of a mediterranean diet. I agree with Kerry, please let us know. I found a whole big container of plain yogurt in my freezer this weekend and am scared to defrost it for exactly those reasons! I find putting it through the blender usually smooths out all the lumps. Also, I second the frozen yogurt idea. So good, and much healthier than ice cream.